Vendakkai puli mandi , is basically a chettinad recipe, with vendakkai | ladies finger based gravy, pairs well with plain rice. Though i have heard this, happened to taste this in my neice wedding, i recently attended in India. Me and my sister got hooked up by its taste and asked the person who was serving, the name of the dish. Then we both went straight into the kitchen and looked for the chief cook and asked him the recipe. He was bit busy that time and gave his phone number and asked me to contact him the next day. So after the wedding got over, the next day i called the chief cook (Mr. Janakiraman) and he patiently explained the recipe and also clarified my queries on few other authentic recipes too. Wash and pat dry the ladies finger. Cut them into big pieces. In a pan add oil and add in the mustard seeds and curry leaves. Once the mustard seeds splutters add the ladies finger to this. Cook this in a medium flame till it becomes nice golden brown. Take the extract of tamarind using the rice mandi. Rice mandi is nothing but the washed water we get from rice. Wash the rice once and discard the water. Add some more water and wash for the second time and preserve the water for making this vendakkai puli mandi. Add the tamarind extract using 1 and 1/2 cup of rice mandi (washed rice water). Add red chili powder, salt and turmeric powder to this. Meanwhile grind the coconut, fennel seeds, onion and garlic into a fine paste using little water. Add the ground masala to the pan. 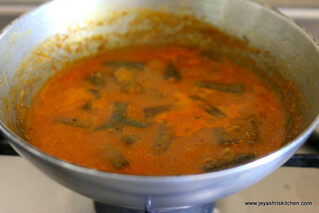 Mix well and let it boil nicely till it reaches a gravy (kuzhambu) consistency. Once it reaches nice thick gravy consistency add jaggery and switch off the flame. Mix well. 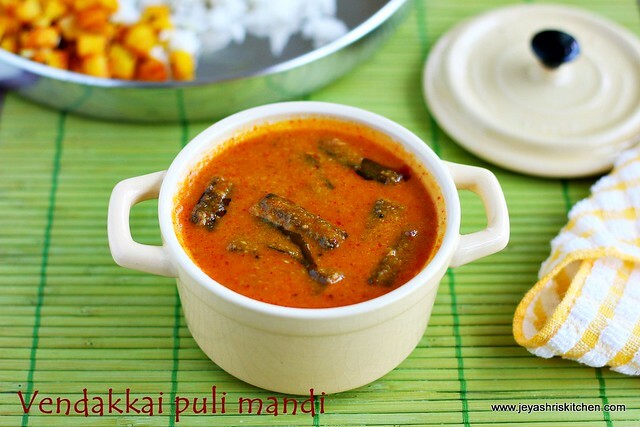 Puli mandi is ready to serve. This can be served with dosa too. Cook the ladies finger nicely without getting it burnt. You can grind a small piece of cinnamon too. Since i don't like cinnamon, i didn't add. Very Nice..can we use any other vegetable. Really interesting... especially making it in kanjivellam... pinning this up! Looks tempting.. will definitely try this..
How much jaggery do we need to add? I made this today. Was simply divine, and got over in minutes. This will surely be a repeated recipe in our house! Bookmarked it. Gonna try this tomorrow. Can we make this with any other veggie?